Here at Wanda’s in Perth, we thought now might be a great time to introduce some of our fantastic team to you! Jason has been working with us for almost two years, while Tamara has been with us for just over one year. Together they make up our incredible heavy-duty team! Jason has a wealth of experience, particularly when it comes to hardscaping and landscaping, and has been interested in gardening since he was a child. “I’ve been digging gardens and making ponds since I was a kid,” says Jason. “Mum’s very much into gardening, so I guess I picked it up from her. As an adult, my main career was building houses and being self-employed, which was actually a lot of hard work,” he says. “It’s been really good working for Wanda. I’m happy. I enjoy being in the gardens and meeting people, and I especially love the topiary work, which I’ve been doing since I was twelve years old”. Tamara is from Croatia and has also been involved in gardening since she was young. “I grew up in Croatia, and I come from generations of family who are into gardening and farming,” says Tamara. “Over the years my skills have developed, especially after working for a company such as Wanda’s because there are such a wide range of things to do,” she says. “I worked in a nursery for quite some time before joining Wanda’s, so I learned a lot about plants and soil properties. I’m no stranger to manual labour, but I also enjoy visual arts. On any given day, the team can be found moving large piles of sand, building retaining walls, landscaping or shifting limestone. 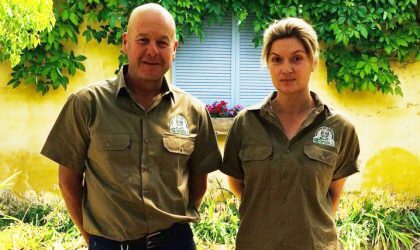 For all your Perth garden makeover and landscaping needs, talk to Wanda’s today. Call us on 9450 6165, or complete our customer contact form here.